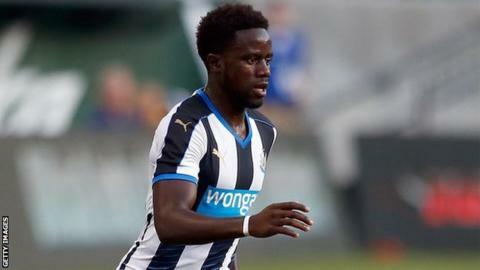 Coventry City have signed Newcastle United midfielder Gael Bigirimana on an emergency loan until 3 January. The 22-year-old started his career with the Sky Blues before joining the Magpies for £1m in July 2012. "I'm looking forward to working with Gael and I'm sure he'll add a valuable option to our midfield," City boss Tony Mowbray said. "I'm sure he's looking forward to coming back and making a positive impression on us." Bigirimana made his debut for Coventry in August 2011 and went on to make 28 appearances that season before he was snapped up by Newcastle. He made his Premier League debut against Aston Villa in September 2012 and has played 25 times in all competitions for the Magpies, scoring one goal. Bigirimana, who made his debut for Burundi on Sunday, moved to Scottish side Rangers on loan in February but did not play any games because of a medical condition. He arrives at the Ricoh Arena with the promotion-chasing Sky Blues second in League One.